Indian boys navigate their way through a waterlogged street in Mumbai, India, Sept. 20, 2017. As India’s financial capital, Mumbai, reeled under swirling floodwaters in August after it was lashed with more rain in 12 hours than it receives in two weeks, the inevitable question followed: Are such events being increasingly triggered by climate change? A new study gives an answer. It says extreme rainfall events that lead to widespread flooding, and have risen threefold across a vast swath of Central India since 1950, are the result of rapid warming of the Arabian Sea. The bad news is that they could increase in frequency as climate change continues to warm the oceans. The good news is that these events could become more predictable as they are linked to rising sea temperatures according to the study. “A moisture surge from the Arabian Sea over the Indian landmass is one of the major culprits for huge increase in widespread extreme rainfall,” said Professor Subimal Ghosh at the Indian Institute of Technology (IIT) Mumbai, who was involved in the study. 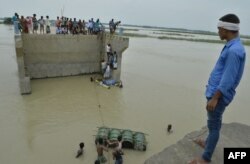 Indian villagers attempt to cross flood waters, Aug. 18, 2017, with the help of rope and empty canisters next to a washed away portion of a bridge at Palsa village in Purnia district in Bihar state. In recent years, the frequency of flash floods that kill hundreds, displace millions, cause urban flooding and leave farmland inundated have increased in India even in areas where monsoon winds have been bringing less rain. Central India is one of the hardest hit areas. In the last two months, Mumbai, a coastal city lying off the Arabian Sea, was not the only place to experience extreme rainfall, several parts of neighboring Gujarat state coped with torrential rain in short spells and the countryside was also hit by flooding. One of the dominant factors warming the Arabian Sea is increased carbon emissions. But its temperatures are rising more because unlike the Pacific and the Atlantic, it is land-locked in the north, which causes a lot of extra heat because of global warming to be trapped in the basin, according to Roxy Mathew Koll, co-author of the study. The study was conducted by scientists from the Pune-based Indian Institute of Tropical Meteorology, IIT, Mumbai, and University of Maryland, USA. Pointing to the need for refining forecasting methods, the study said the warmest ocean temperatures appear two to three weeks before the event, giving an opportunity for better warnings. Koll said these events are predictable a week in advance so that the public is alerted and precautionary measures can be taken. For example, schools and offices could be shut and people in low lying areas moved to higher ones. According to the study, there were 268 floods in India between 1950 and 2015, killing almost 70,000 people and leaving about 17 million homeless. A study by the International Monetary Fund this month said countries in the tropics, which include India, will be hit hardest by global warming. Such concerns are shared by environmentalists in India, who have been highlighting the urgent need to tackle global warming.